Most people experience no side effects or have only mild gastrointestinal discomfort when taking probiotics, the National Center for Complementary and Alternative Medicine reports. Since the bacteria can cause gas, you may experience very slight abdominal pain. Intense stomach pain is probably not caused by probiotics, and you should report it to your physician immediately. Probiotics are live bacteria similar or identical to the "good" microorganisms in your body. They may help with a variety of conditions including diarrhea, irritable bowel syndrome and inflammatory bowel disease. If you visit the dentist, he may use probiotics to treat gingivitis and periodontitis or to prevent tooth decay. Lactobacillus and Bifidobacterium are the most common probiotics on the market in the United States. 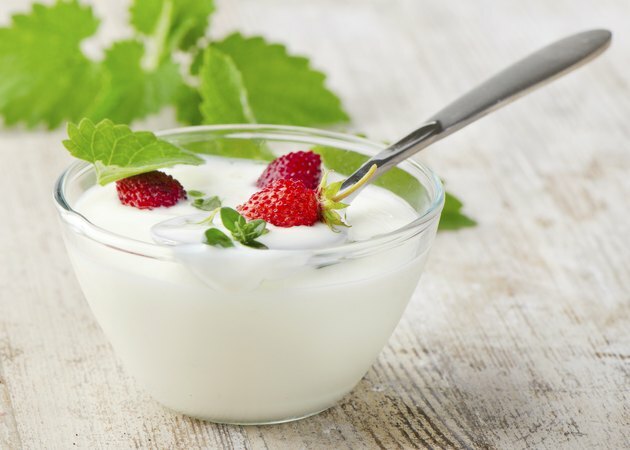 Probiotics are available as supplements in pill, tablet and powder form and as food in live-culture yogurt. Although probiotics rank fifth in the U.S. among natural products used for kids, the Food and Drug Administration has not approved any health claims for probiotics, according to the National Center for Complementary and Alternative Medicine. Do not take probiotics or any other supplement without your physician's recommendation. Critically ill people should not take probiotics. How do I Cure Candida With Betaine HCL & Probiotics?